You can now get your Toyota services right at your doorstep with Toyota’s ‘Service Express’. 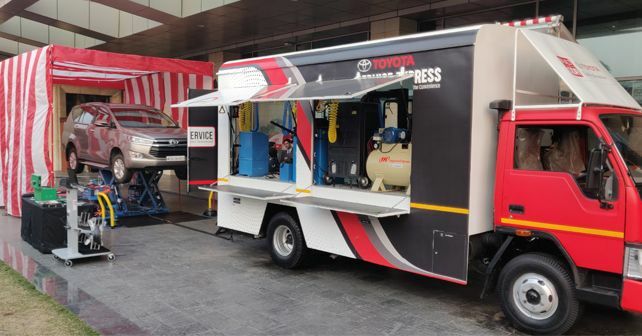 Toyota Kirloskar Motor has just announced that they have launched a new after-sales initiative ‘Service Express’. Under Service Express, Toyota will allow customers the ability to opt for a regular interval service of a Toyota vehicle right at the customer’s doorstep. The manufacturer claims that customers who chose to avail the service will be able to get all periodic maintenance services which are minor, medium or major. The service requires just an hour and in addition to the regular maintenance, they will also offer wheel balancing, wheel alignment and even eco-car wash. Further, Toyota also intends to provide car beautification services & minor body-paint jobs under this easy access servicing experience. The manufacturer will be rolling out the service in a phased manner through their authorised dealership network across the country. Currently, the service is catering to remote areas of Rajasthan. N. Raja, Deputy Managing Director - Toyota Kirloskar Motor, said, “Convenience plays a very important role towards providing delightful services and ensuring peace of mind to customers. At Toyota, we always listen to our customers’ voice and strive to make our service offerings ever-better, providing ease access to Toyota’s car care. Our aim is to limit the constraints of fixed location set-up of car servicing with ‘Quick Service’ offers at customers’ doorsteps, bringing the best-in-class service experience even closer with these ‘On-wheels’ touch-points. Toyota currently offers eleven models in the Indian market. These include the Etios Liva, the Etios sedan, Etios Cross, Yaris, Corolla Altis, Innova Crysta, Fortuner and the brand new Camry Hybrid which are manufactured in India. While the Prius, Land Cruiser Prado and the full size Land Cruiser are also sold in India, these models are brought in as completely built up units.